Weld County Regional Communications Center and the Fort Lupton Fire Protection District use a “Reverse Notification System” CODE RED to notify residents or businesses of police or emergency services activities in their area should the situation all for them to take appropriate steps to safeguard their own lives or property. These notifications can be received via, text, e mail, or voice message. 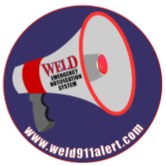 Please go to weld911alert.com to register. The CODE RED system will offer an OPT-IN option for the citizens, to include Weather Notifications via text or email. This new system also offers a FREE Mobile App – that will notify you of any CODE RED notifications if you are in the CODE RED notification area anywhere in the country. Weld County has upgraded its Emergency Notification system to CodeRED, a high-speed emergency notification service allowing local public safety agencies to deliver emergency messages via voice, text, and email. All residents and businesses are encouraged to go to weld911alert.com and enter their contact information, even if they have signed up with the previous emergency notification system. There is no direct charge for this service, and at sign up you may select which types of warnings you’d like to receive. Weld County Residents can also sign up for CodeRED Weather Warning, an automatic severe weather notification service, to alert citizens in the path of severe thunderstorms, flash floods, and tornados. If you know of anyone who did not receive this message, or a phone call, and lives in Weld County, please encourage them to visit weld911alert.com to enter their information, as this is the fastest way to sign up for the CodeRED service with Weld County.